Having the features, tools, and widgets you need out of the box is good. Configuring them in a unified, cohesive user experience is even better. View the supported browsers, and the ArcGIS and Geocortex Essentials versions that Geocortex Viewer for HTML5 is compatible with. Download Geocortex Viewer for HTML5 from the Geocortex Support Center. Install Geocortex Viewer for HTML5 to add HTML5 viewers to your Geocortex Essentials sites. 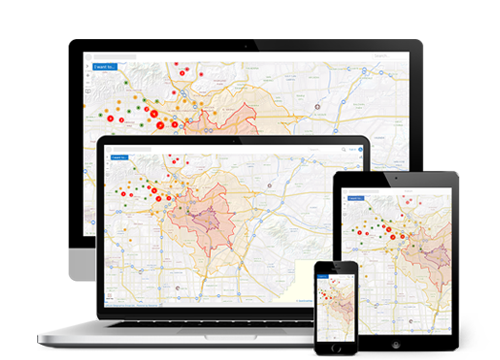 Add an HTML5 viewer to a Geocortex Essentials site and launch the viewer. The Home panel is a multi-purpose panel that you can use to identify your organization, provide instructions to users, or anything else you want. Customize the “I Want To…” menu, which provides quick access to common tasks. Choose from dozens of predefined tools – or create your own – and customize your toolbar. Allow users to add new features to a layer or modify the attribute data of existing features. Geocortex Mobile App Framework makes it possible to run Geocortex HTML5 viewers when there is no network connectivity.